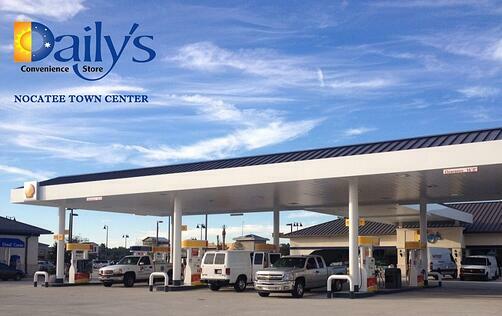 First Coast Energy, parent company of Daily’s, plans to build a store on a 1.37 acre site at the Nocatee Town Center. The 5,700 square foot flagship Daily’s store will sell Shell gasoline and include a state-of the-art car wash capable of providing a touch-free wash, a friction wash or a combination of both. The store will also include a Dash, Daily’s new, fast-casual restaurant concept. Dash offers a variety of made-to-order breakfast and lunch sandwiches, specialty coffee drinks, soups, salads and fresh-baked desserts. Dash prides itself on providing fresh, all-natural, wholesome dining options and offers a number of gluten-free products as well. Both indoor and outdoor seating will be available at Dash. First Coast Energy plans to begin construction on the new Nocatee Daily’s in July, 2014, with an expected opening date of November, 2014.